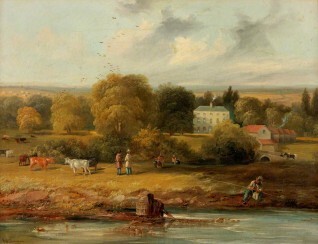 The Laing Art Gallery opened a discussion to try to identity the country house in John Wilson Carmichael’s painting, with its only possible leads being that it was donated in 1938 by a local collector and described as a ‘portrait’ of a modest and unidentified house, probably in the Tyne valley. Cliff Thornton commenced the discussion with the suggestion of Close House Mansion at Heddon on the Wall, after he noticed similarities between the architectural compositions of the two buildings. He also noted the inclusion of fishing nets, which suggested to him a location near the Tyne – in those days one of the best salmon rivers in the country. However, group leader Andrew Greg deemed this proposition unlikely because of Carmichael’s general architectural accuracy in paintings and discrepancies between the two properties, such as the missing pediment in Carmichael’s painting. Greg then proposed Biddlestone Hall in Northumberland as a potential candidate, adding that Carmichael’s associate Dobson worked at the hall, now demolished, in around 1820, suggesting a connection between the artist and the property. This proposal was contested too, with Pieter van der Merwe querying the architectural plausibility of the painting in comparison with the property, and Osmund Bullock arguing that OS maps from the period reveal Biddlestone Hall’s location to be nowhere near a river. Several other suggestions were made, including Nunwick Hall by Richard Young and Cocken Hall by Andrew Chamberlain, however again to no avail. After two years’ discussion, and because of the limited evidence, as well as the minute scale of the building within the composition, Greg suggested that the painting may not be a ‘portrait’ at all, but rather a generic North East English landscape rather than a representation of a particular house. Nevertheless, any further information about this work would be greatly appreciated, which can be done by proposing a new discussion from the artwork’s page on Art UK. Can you identify this country house, possibly in Northumberland on the banks of the Tyne?